Thanks to a great captain and an insightful tour guide, Terry Zoller of MnDOT, the group enjoyed the afternoon sun and spectacular views while circling the bridge piers and learning about some very complex, unique, and impressive construction practices. With an extradosed design, the bridge combines the long-span and slimmer deck feature of a cable stayed bridge, with the lower profile of a concrete box-girder, and allows the pier towers to be shorter and less intrusive to the scenic valley. As Minnesota’s next major infrastructure icon, it will be the second bridge of its kind in all of the United States. The River Bridge is scheduled to be open to traffic in the late fall of 2016. 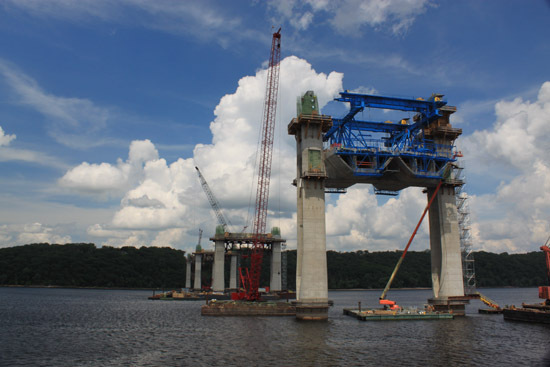 Construction of this project began in 2013, with a separate contract to construct the pier foundations and roadway approaches. Pier construction is now well underway. At a few of the piers, the group saw the construction of the crossbeam. And at other piers, the segments were already being placed off of the pier tables. As part of the project, the team will also be constructing the loop trail. The trail consists of a 4.7-mile bicycle and pedestrian trail across the existing Stillwater Lift Bridge. The loop trail construction will be completed in 2017. After the cruise, much of the group hung out for a social debriefing at the Lion’s Main in beautiful downtown Stillwater. It was a great day to be outside and take in a perfect summertime afternoon. The river bridge piers are designed to move 6” from winter to summer. The bedrock is approximately 129’ deep. There are 320 people working on the bridge construction. Segments of the bridge are constructed in two casting yards and are shipped via barges to the site. There are 650 segments in the river span. The segments are 18’ tall x 48’ wide x 10’ long, and some weigh up to 180 tons a piece!